Those who dwell in the north of Westeros can be as harsh and cold as winter itself, but words like honor and trust still have meaning there. Fearsome in battle and uncompromising in negotiation, the men of the north are hardy and well equipped to survive winters that can last for years. Though they may scorn the laws that come from King�s Landing, these warriors are fiercely loyal to the lords of House Stark, and some believe the time has come for the north to rise once more and become a true kingdom of winter. Journey northwards and take your place among the knights, lords, and ladies of House Stark with Wolves of the North, the first deluxe expansion to be released for the second edition of A Game of Thrones: The Card Game. In this expansion, House Stark takes the spotlight as they gain new cards to bring your Stark decks in new and unexpected directions. You may use Direwolves to cow and overpower your foes, rush to victory with the aid of House Tully, or draw strength from the Winter itself. 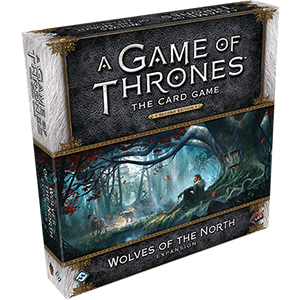 Throughout the box, you�ll find new versions of iconic characters like Eddard Stark, Catelyn Stark, Jon Snow, and Arya Stark, alongside characters entering the game for the first time, including The Blackfish, Shaggydog, and Rickon Stark. Though the focus of this deluxe expansion rests firmly on House Stark, every other faction receives two new non-loyal cards to push your deck exploration forward. An assortment of neutral cards, including six new neutral plots, change the options available to every deck, and you�ll be able to call on dangerous new allies like Mance Rayder, Quentyn Martell, and Aggo.